If the answer is yes then believe it or not, you aren’t alone. Modern life has created the perfect recipe for loneliness: isolation, social media, and for many -exhaustion. With the increase in technology, we’ve become more connected than ever before. Yet despite all the platforms, tools, and devices to maintain contact with each other, we’ve become increasingly lonely. Humans are naturally driven to seek relationships with other beings. We crave friendship, camaraderie, and someone to confide in. Studies have shown that isolation causes psychological distress that can lead to mental health issues, illness and even premature death. Experts are of the opinion that loneliness poses a health hazard as dangerous as obesity and smoking. Meditation has been found to be beneficial in helping to reduce feelings of loneliness. It assists you in expanding your field of awareness, embracing practices such as loving-kindness and learning how to notice your emotions without becoming attached to them. 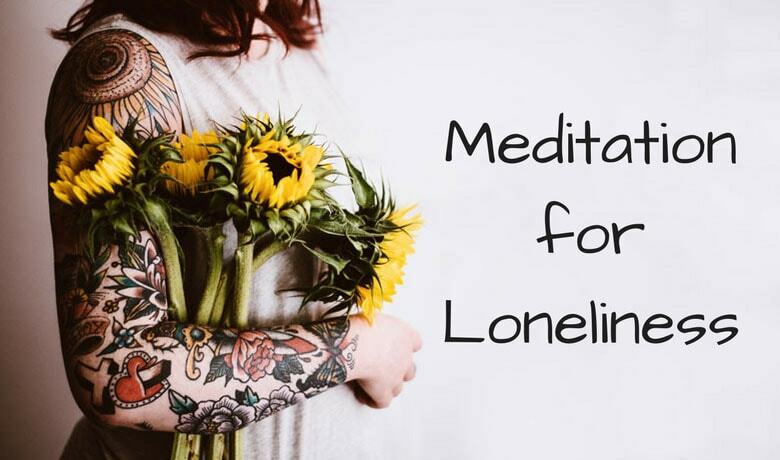 The next time that you find yourself feeling isolated and distant from the world, try this meditation for loneliness. Loneliness is a state of mind a person experiences when they perceive themselves to be isolated from society and aren’t getting what they need and or want out of social relationships. People can also become lonely as a result of feeling emotionally exhausted and burnt out. Almost 50% of the American workforce is either permanently or frequently exhausted. This is a 32% increase from just 20 years ago. Chronic loneliness puts the brain into self-protect mode. It causes psychological stress that can lead to depression and many other diseases (see below). As writer Andrew Solomon eloquently put it in The Guardian, “Depression is a disease of loneliness”. Loneliness has been found to reduce academic performance, creativity in the workplace, productivity and an increase things such as deviant behavior at work, accidents, interpersonal conflicts, substance abuse, absenteeism and even smartphone addiction. At the clinical level, loneliness can resemble depression, anxiety, and boredom. The number of people experiencing loneliness has been increasing significantly since the 1980s. Britain for example has has even appointed a Minister of Loneliness to help tackle this growing challenge. Not all people who are alone are lonely, just as not all people who are in the presence of others feel connected. Unsocial people are comfortable being alone and do not fear their solitude. For them, being predominantly by themself doesn’t cause the same kind of pain and suffering as isolation does for other individuals. Loneliness is often a private matter and while it’s experienced in silence, it remains hidden from others. Shy and introverted individuals can be especially vulnerable to loneliness. In an attempt to reduce their feelings of isolation, shy people may avoid in-person contact but instead choose vehicles such as instant messaging (IM) to connect. Loneliness can be very dangerous for your health. In fact, research has found that it’s even more dangerous than obesity, and can reduce your lifespan as much as if you smoked 15 cigarettes per day. A review of 218 studies in the United States found that lonely people are 50% more likely to die early deaths than those people with strong social connections. Loneliness increases your stress hormones and can lead to chronic inflammation. Inflammation in turn makes you more susceptible to illnesses such as cardiovascular disease, Alzheimer’s, dementia, arthritis, Type 2 diabetes, and can increase suicidal tendencies. Loneliness is a universal experience. It can affect people of any age, gender, or ethnicity. A recent study found that three quarters of the American population is lonely. The internet and social networks have contributed to a rise in loneliness. Young adults for example, were brought up in the era of personal computers, the internet, and social media. For many, these platforms replaced real relationships in exchange for those on-screen. Unfortunately, these new technologies are increasing their feelings of loneliness. The millennial generation in particular has become a very lonely one. And it isn’t just social media and the internet causing the issue either. Teenagers are often depicted as the “poster child” of loneliness. Assigned stereotypes such as lazy, unruly, and rebellious, many are feeling very isolated. And not just from their peers, but also their parents. But it isn’t just the younger generations who are lonely. Approximately 42.6 million adults over the age of 45 in the United States are believed to suffer from chronic loneliness. Elderly individuals who cannot easily leave their homes are also incredibly vulnerable to becoming lonely. According to the World Health Organization, as older people face additional stressors such as chronic pain, reduced mobility, even retirement, they can become lonely and isolated, and as a result can develop mental health issues. Additional challenges associated with social isolation and loneliness can impede daily activities and negatively impact quality of life. One thing many people don’t know is that loneliness is contagious. It can spread through social networks, increasing feelings of isolation among group members. According to a study, the average person experiences around 48 days of loneliness per year. If they have a lonely friend, this can add an additional 17 lonely days. What this means is that one lonely person can infect an entire group of individuals. By associating with lonely people, you might actually be making yourself lonely too. There are lots of circumstances that can make you feel socially isolated. In fact, you can feel lonely at home, in a relationship, at work, or even in a crowded place. Feeling lonely doesn’t mean that you’re by yourself. Similarly, being by yourself doesn’t mean you’re lonely either. Social media is often seen as a prime culprit behind the growing wave of loneliness. Extensive time spent on platforms such as Facebook, Instagram, and Snapchat for example can lead to feelings of isolation. It might seem counter intuitive because you’re engaging with other people, but this interaction is behind a screen and doesn’t effect us the same way. According to psychotherapist and author Tom Kerstig, interactions experienced through social media are not the same as those experienced face-to-face. In fact, they can often leave you feeling isolated, left out, and that your life isn’t as “perfect” as those portrayed online. Although social media and the internet in general can contribute to loneliness, it’s far from the only cause. Studies have found that meditation, even if only practiced for short periods of time can reduce feelings of loneliness. When you feel lonely, this is often because you perceive yourself as being separate from the world. Meditation helps to bring awareness to the fact that all beings are connected. That all life is connected. And that even if you might feel separate from others, in many ways, you are in fact connected. An additional benefit of meditation is that it helps to develop an awareness of your emotions. It helps you recognize that they’re temporary in nature and subject to change based on different circumstances. This mindful recognition helps you see that you are not your emotions. For example, just because you’re feeling angry doesn’t mean that you’re an angry person. It means that for those few minutes or however long the emotion took hold, you were experiencing angry thoughts or its effects in your body. Don’t try to block out feelings of loneliness or categorize them as negative feelings. Instead, recognize, acknowledge, and let them go. Regular meditation practice helps you become aware of the fact that emotions come and go through your mind. You don’t need to ignore, repress, or try to block them, but rather see them as they are. Simply becoming aware of your emotions is a powerful skill that can help you transform any moment. Another reason why meditation can be beneficial for individuals suffering from isolation is that it helps you to recognize the interconnectedness of life. This kind of practice can also help break the cycle of distress that leads to feelings of loneliness in the first place. Meditation is more frequently being prescribed as a form of intervention for individuals suffering from depression, anxiety, loneliness, and chronic pain. Practices such as mindfulness are also being suggested for children who are struggling to cope with loneliness. One of the great things about meditation is that it can help you become better acquainted with yourself. It encourages a kind of honesty with your own mind and heart that isn’t otherwise explored. When you practice meditation for loneliness, you’re opening up to your emotions. This alone is an expression of self-compassion. Additionally, it helps to foster an awareness that can help release you from your emotions. Anyone who has ever experienced loneliness will know just how painful it can be. For this reason, lots of people try to repress these feelings. Ignoring or indulging in these emotions can unfortunately result in more suffering. Instead of trying to block out feelings of loneliness and isolation, use your awareness to notice these thoughts as they begin to develop. Pay attention to how they change the way you think, feel, and act. If it helps, you can even practice a very simple technique by formally greeting your emotions. Studies have found that social connectivity can be increased using loving-kindness meditation practices. Loving-kindness meditation (also known as metta meditation) not only benefits the practitioner by providing numerous mental and physical health benefits, but also increases positive emotions towards society while reducing feelings of isolation. Additionally, it can also increase feelings of positivity expressed towards strangers. Find somewhere comfortable where you can practice undisturbed for a few minutes. Take a moment to collect yourself and arrive, wherever you are right now. Let go of your to-do list, your need to go somewhere, your guilt for taking time for yourself. Once you’ve settled wherever you are, start to think about a person or animal that you love. Imagine that this person is right beside you. Feel as if you are sending them love, like it is shining outwards from you and enveloping them. May you feel love, joy, and peace. Then if possible, think about someone (either human or animal) who has shown you love and kindness. Imagine them beside you, sending you love. Take a breath for each recitation of the following mantra. May I feel love, joy, and peace. Envelope yourself in feelings of love, both from giving and receiving. If you have time, continue this exercise to encompass as many people as possible who have brought love into your life. Feel the closeness, gratitude, and unconditional love shared with these people. Sit with this trusting feeling of kindness and connection. Close your practice with extending this feeling of love towards those you don’t even know. You can wish them happiness, good health, and success. Sending out the wishes for which you wish to receive in return. Take another breath and prepare for the final mantra recitation. May we all feel love, joy, and peace. Now take a few moments to quietly come back to the present. And if it feels natural and authentic- smile. Stay here as long as you wish, enveloped in love and kindness. When you’re feeling lonely, it’s important that you recognize your emotions and take action. Sometimes just sitting down for a few moments and acknowledging your feeling will offer relief. Sometimes getting outside or connecting with a friend is all it takes to shake the feeling. If you suffer from chronic loneliness, you might wish to consult with a professional to help you work through this difficult emotion. Loneliness is an incredibly painful universal emotion. Despite the fact that as a society we have become more connected, more and more people are feeling lonely and isolated. Regular meditation practice can help you become aware of your emotions. It can assist you in recognizing your thoughts without becoming attached to them. Another great benefit of meditation for loneliness is that it builds an awareness of our connections with each other. The next time you notice lonely thoughts passing through your mind, try a simple meditation practice. You might just find that loneliness can become a great teacher for learning to let go. Wow. This is exactly what I needed to read right now. Thank you. A million thanks for posting this inomafrtion.